These high-quality acrylic dice are 6-sided with recessed pips that are painted white. 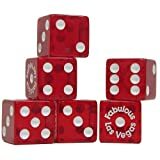 The #1 side has the words “Fabulous Las Vegas” written into the dice. These dice are translucent and are ruby red in color.